Since I seem to be stuck in mazes and cages this week, it’s perhaps no surprise that Christian Boltanski’s installation for the French pavilion at the 54th Venice Biennale last year has worked its way back to the front of my mind. For me, this was one of the highlights of the Biennale though admittedly I think I’ve yet to see a work by Boltanski that I haven’t liked. 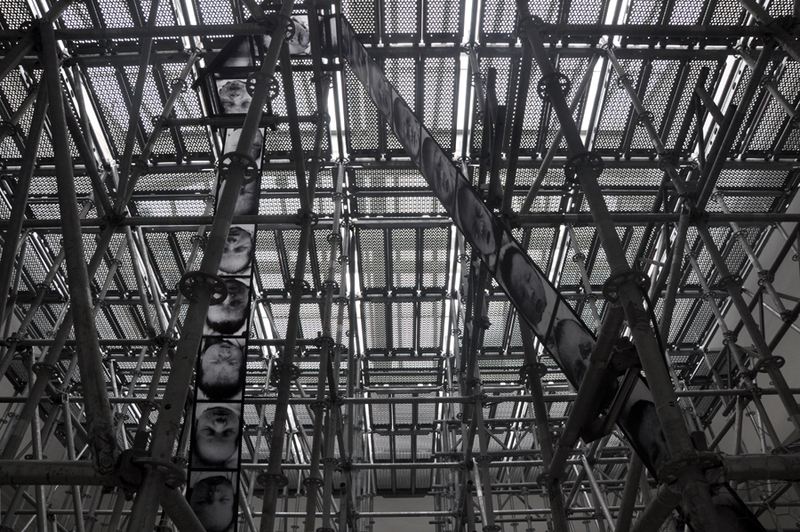 This work does feel quite different to most of Boltanski’s installations though, not least because it’s playful – literally, in that it includes a game – and open to a hopeful reading, though more sombre interpretations are also possible. The main part of the space is occupied by a maze-like scaffold structure through which I loop of baby portraits runs like an overgrown film strip taking the long way round though a projector. The sight is an extraordinary one but there are obvious connotations of a baby factory. The noise of the mechanism is loud, dominating the space. Periodically though a bell rings and the thing grinds to a halt, putting a single baby’s face up on a screen. By chance, this is the chosen one. Singled out for what, there’s no way of knowing. It’s at this point that the closed eyes of the newborn babies become most apparent; they look peaceful but the sudden stillness could also suggest death. In the two side spaces, large digital counters are busy counting people. On one side, in red, the deaths. On the other, in green, the births. The counters count up to the daily averages in both cases. the balance is firmly in favour of life, with births outnumbering deaths by quite a wide margin. Setting aside concerns about overpopulating, this at least seems like a cause for optimism. But then setting aside concerns about overpopulation is something we really shouldn’t be doing. 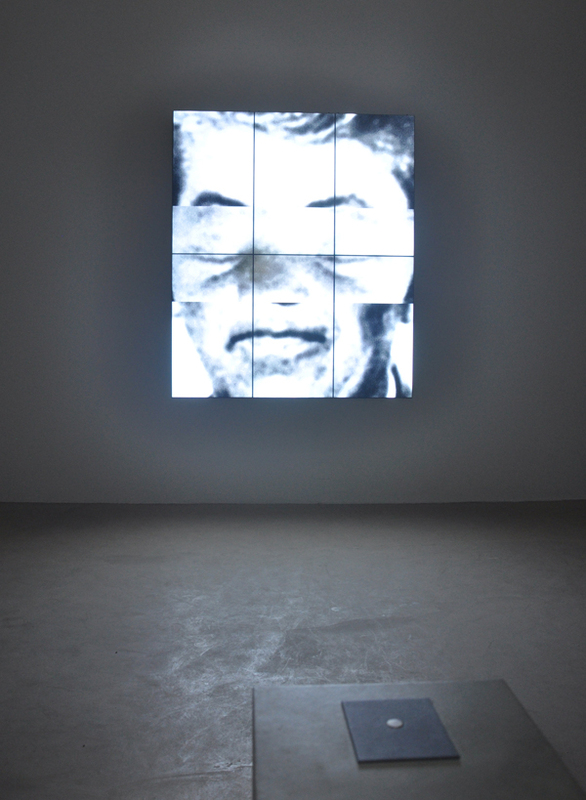 In the final space, the back room of the pavilion, there is a fast changing sectioned portrait projected onto the wall. Pressing the button freezes the image. The babies from the factory are merged with parts of the faces of adults, the chance of birth played out as a random game. Anyone managing to freeze the image as a whole portrait would win the image. The Venice Biennale isn’t somewhere I’d normally expect art as entertainment – though Allora and Calzadilla’s combined ATM and organ which played music when anyone withdrew cash was rather more frivolous – but Boltanski manages to make the work both thought-provoking and a game. It’s perhaps unsurprising then that those needing a little sit down as they leave the building find the chairs talking to them quietly. 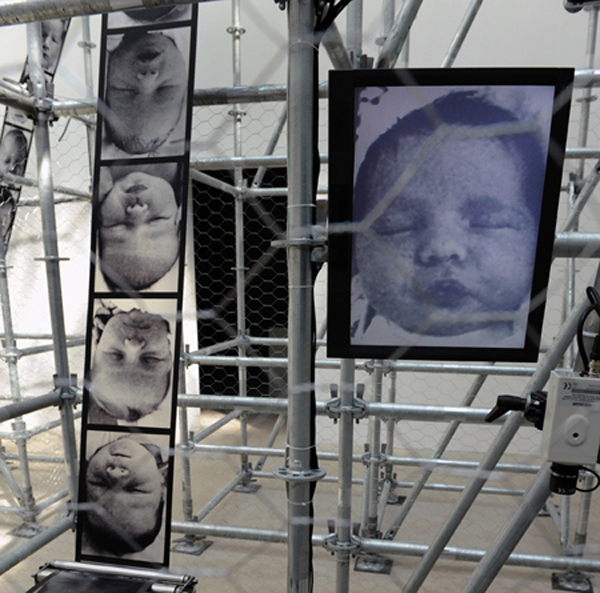 This entry was posted in Installation, Photography, Sculpture and tagged art, babies, birth and death, Chance, Christian Boltanski, France, installation, photography, Venice Biennale by Ann Jones. Bookmark the permalink.